Re 2015 Paris Climate Change Accord: People feel like it won't do anything, it won't be enforced but actually, although at first it's a way of making money for people, it is a step forward, and can create a foundation that can be built on. More people take in refugees once they adjust to the new reality that they're coming. Acceptance is stronger the second half of the year. Gun violence laws are put together so it's a different and better situation in the U.S.
What Americans want from the next administration, is to be given to. They want a fair shake and a good deal, and the next President could be a service-oriented Virgo. Bernie Sanders is a Virgo, incredible to believe as that win would be. Wherever we get to, we are going to have to work for it and keep a narrow focus on what makes us happy. Then we have the necessary energy. Last year, many gifts were given that could create meteoric rises. This year, gotta keep on it, keep focused, to create enduring success, and do the work. A message from your goals, answering the question: "What must each person do to get what they want, what is the appropriate action to take and sacrifice to make?" For the Fire signs, Aries, Leo, and Sagittarius: What gets you what you want in 2016? Persistence, and staying the course. For the Water signs, Cancer, Scorpio, and Pisces: What gets you what you want in 2016? Keeping your head above water, meaning, pay attention to what you want to grow in your life, not your emotional reactions to things. Do this for the sake of the inner world you want to be in, and the operating state of consciousness you aspire to. For the Air signs, Gemini, Libra, and Aquarius: What gets you what you want in 2016? Faith in yourself and life; willingness to be happy; being innocent; trying new things; being able to start all over... just like a little kid who wants to play, if he gets knocked down, he gets up quickly so he can get back to the game. For the Earth signs, Taurus, Virgo, and Capricorn: What gets you what you want in 2016? Moving through any setback with maturity. It's a good year, but not all of it is easy or pleasant. Losses are clearly not the trend of your life; the trend is good. Once you move past any loss or disappointment, there is your wonderful life again! Tarot for the Fire signs, Aries, Leo, and Sagittarius: Your new ideas are the ones you want to try, the ones you're going to be rewarded for, the ones that expand you, and the ones that are coming to you through new insight. You can connect with a lot more people or a larger world. You feel freer this year. The world is a friendlier place and more willing to engage with you. Tarot for the Water signs, Cancer, Scorpio, and Pisces: Your year is spent evolving, getting to a new place, figuring things out, overcoming restrictions. With strong determination you're getting somewhere new, and on your way to a new vision. Tarot for the Air signs, Gemini, Libra, and Aquarius: Expect a huge boost of self-confidence this year. You can do new things, but new things that you've already developed skills around or have been working on for awhile. There's a tremendous elation you can feel being on your own, doing whatever represents independence. You feel much better about yourself and are more at peace. Tarot for the Earth signs, Taurus, Virgo, and Capricorn: Because of love, or because of some creative thing you love to do, you leave behind a very familiar scenario for what is more fitting for you now. You're concerned about how it's going to affect your life. Can you make as much money, can you make this transition? Expect to deal with some kind of stress about it, but basically leaving behind what's familiar is what gives you peace of mind. Aries: You've got your best ideas yet. People have more faith in you...they show this to you through their contracts, commitments, and opportunities you receive. This is a time of cooperation, new enterprises, and new partnerships with people that really get your business going. You get the help you need. This is a much more solid year than last. Taurus: Things happen fast this year. You make decisions fast. In the beginning of the year, you change locations or change work or you're in your second home. You're ready to go in the beginning of the year after an iffy-feeling lead-up the last month or two. You might be establishing a new business. Things are very well-thought out; you've made the tough decisions already, and now you're implementing them and establishing yourself and doing what earth signs do well: stabilizing yourself. Gemini: The concept of being right... being in the right place, acting on your right fate, all stays in the forefront this year. It's like you took a gamble...you understand what's right for you and you're much more powerfully implementing it. There's a strong influence from the sun, planet of success and health and making the right choice for your future. You get many more things right about your life and can establish yourself with more confidence: it's clear you've made some important basic right choices. Cancer: This is a year where things come to a head. This can be a little overwhelming, and you can expect some conflict because of the changes that seem inevitable or are happening to you. But there are some things that must be done. It's like the earth moves right in front of you and you must respect the changes and decisions around them. The unexpected can occur, but everything that's happening is meant to be, and the first step is accepting changing circumstances that may be hard to understand at first. On a high note, you're given a chance to increase your income, be part of a team or institution where you can get more money, and be happier! Leo: This is the year of inner accomplishment where you gain much more control of your mind. You want your mind to work better, and to achieve inner peace. This is a year where you deal with resistance, and what enables you to move through resistance is a more strongly felt love for life, love for yourself, and love for others. You might go through resistance about getting to what you really want, but you're going to keep on making those important choices that lead to your own fulfillment. Virgo: Life is a lot clearer for you in 2016. You might get married! You make the right connections and relationships are very good. Something you begin really works! It's a perfect year to start a new venture. You know where you belong, you know who you belong with, and you know what you belong doing. The Sun smiles on Virgos! Libra: This is quite a business-like year, but it needs to be because you both want to step up...maybe you want to move, or know more what you want in terms of the material world. You know how to get it: you have to connect up with a certain establishment or business, but it looks like that connection is made and you're able to do better financially in 2016 or by the end of the year. Scorpio: It's looking like a very creative year! This would be a year that if you wanted to, you could get pregnant and the timing would be good. You have recently disengaged or left situations that allow you to do more of what you want. You're freer, and you're better organized financially and more physically able to be creative and expressive. You might have a very big project that begins later in the year, perhaps October. There might be a lot of build-up to it where you have to get ready for it with concrete steps. Sagittarius: You can work your way out of any situation. Look at everything as a work in progress: your health, your relationships, and your financial goals. This is a year where there are not big moves on your part, but your work is to just keep things humming along. Still, you could be worried, but for nothing. An even pace is best as you put the work into what you want to achieve. It's a more even year altogether. Capricorn: This year you have to give a lot to get what you want. Luckily, you feel strong. There's another possibility that you have to deal with situations that take emotional strength. These will not be your fault; it's just what happens. This is a good year to have challenges because you're particularly strong in mind, body, and spirit. Things aren't very clear in the beginning of the year to get where you want financially, but give it more time...April is more telling. Aquarius: You're quite busy in the beginning of the year. You may have been given a big project which make the holidays feel like they are practically an interruption. This is a year where you don't have to ponder too much. You're quite busy doing your part in something that's developing, and inspiring. It looks as if you've got the luxury of being quite involved in your dreams and your potential and not so worried about instability, but focused on the hopeful future. Pisces: You do a lot of thinking this year. You're moving yourself forward, you're moving your projects forward, but you're also moving partnerships forward and getting used to a new order with partnerships. It's a less touchy-feely year. Things are changed, things are different this year...you're moving towards a different fate, and with partnerships that are more supportive than in the past. This is a year of much greater balance, but maybe more sober-feeling as you move towards a new sense of being settled. The year begins with Mars in Libra, which as an omen, suggests a power shift and pendulums swinging in a way that makes life more fair. But on January 3rd, Mars moves into Scorpio. Interpretation: Any recent achievements in 2015 must be accompanied by deep and strong follow-through in 2016, to reach the new land we've glimpsed. Four Mercury retrogrades: The first mercury retrograde of the year could feel like a short three weeks, January 5th-25th. To take advantage, plan what you want to clean up, clear out, get straight, and review. It will be action-packed...keep it tightly orchestrated so it goes your way! The second Mercury retrograde is April 28th-May 23rd. A good time for a vacation and Cinco de Mayo celebrations! It will seem like a long three weeks. A lot happens to people in this period and they'll be digesting and processing it for awhile. In the middle of it, there's a rare lucky day when the Sun conjuncts Mercury in Cancer and Jupiter goes direct: May 9th. On that Monday, you can have deep and clear understandings that release you into an expansive forward motion. This is a good day to get things cleared up and move on. Last but not least in this Mercury retrograde period, there's a full moon in Sagittarius on Armed Forces Day, with the moon conjunct Mars. That's a great night for a party but it can rev up warlike actions: it's a highly reactive time, potentially, with people misreading cues. It's best to be a laid-back person and sail through others' inconsistencies...choose to enjoy people and have fun that weekend. The third Mercury retrograde is August 29th through September 22nd, and this is going to complicate back-to-school preparations and kids getting used to what's new. Be generous with others and forgive them their mis-steps because it's very easy to be nit-picky during this period. The best use of the time is focus on what you want to begin, grow, and perfect, but only for yourself! The last Mercury retro of the year is December 19th to January 8 2017, starting right before the Winter Solstice, the omen-giver for the coming year. This gives signs (moon in Virgo then Libra) that the coming year will be about creating greater balance and justice and a lot of corrective efforts. This first 2016 article below was posted on December 18th on my blog, and written last Thanksgiving. They are the Speaking Stone messages for the year, and channeled horoscopes for the Fire, Water, Air, and Earth signs. Also, my take on the numerology of 2016. (12/19) Unlike every single psychic on the internet, all agreeing Hillary will be the next President, I think the tenor of the times fueled by extreme inequality and growing poverty, could manifest in the more revolutionary move of picking Bernie Sanders. The collective consciousness does not seem to have, at least yet, picked Hillary. A lot of new things happen, and people come up with radically new solutions for long-standing problems. There is much more cutting away and pivoting away from the past than before. In terms of the world all pulling together, the light of understanding is absent; there is no common goal of a lighter world. The fairly new and separatist organizations, like Isis, take root. Their communication systems get tight and together and work very well. Things can spread: Nobody needs to be anywhere anymore. The internet becomes much more of a global tool and weapon. USA and countries fighting terrorism: We don't seem to have a cohesive, creative response to what is happening. Past solutions don't work. The targets of terrorism carried out by Isis and others are not equipped to coordinate on all kinds of levels: between countries, departments, differing agendas, etc. They do not have the right strong tool. Teamwork and harmony work wonders in 2016. It can grow terrorism, but positive grass roots movements can also get very far through improved communication and ways of connecting with others. No matter who is in the White House, U.S. grass roots movements coming from the people grow in strength. Fear-driven pathological responses to life are acted out even more in 2016. It's as if a tacit, wordless agreement takes place on the level of the collective unconscious, freeing people to indulge in their baser, fear-driven instincts. 2016 is a nine year, the magic number that when you add any number to it, e.g. 5 plus 9, it will always reduce down to the original number: 5. Metaphorically speaking re 2016 as a 9 year teaches that it may look like things are up to others, but they are always up to us. It's the actions you take and the work you put into something that count. Another magic quality is that whatever number you multiply 9 by, the result will reduce back to 9. (9x5 is 45, 4 plus 5 is 9.) Multiplying implies increase (success), and addition implies relationship (learning experiences). The multiplying magic of a 9 year suggests fruition, completion, and its presence in 2016 says that hard work and excellence pays off this year. What we do with our time and how committed we are can lead to magic in a 9 year. Out in the world we will see magic tricks on display, great schemes that are both dark and light - as 9 produces sophisticated plans and resource networks. We will see magic in our own lives if we take responsibility for whatever is happening in it, and assume that the big determinant in our lives is what we do and show up for, not lucky breaks or privilege of position. 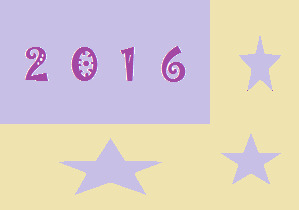 2016 can mete out harsh fates where things aren't fair. Re the challenge of personal transformation: the wisdom of 9 urges us to stay the course on our personal journey towards happiness, because the potential is high for the next phase to be a more complete and magnetic and inspired version of ourselves. For the Fire signs, Aries, Leo, and Sagittarius: You will gain the greatest happiness and growth if you practice what gives you an alternative to thinking; i.e. preoccupied with whatever happened in the past or might in the future. That's because 2016 can be the most wildly creative year, and you wouldn't want to miss it worrying or lost in self-reflection. A life-changing magical act can be to re-order your life so that you are practicing and doing in some way what truly makes you happy. The spirits say: "It requires all of you. Embrace, then, your creative spontaneous self...give it the floor - and then give it some more! Then you can know Heaven on Earth." For the Water signs, Cancer, Scorpio, and Pisces: You can experience separation between you and people in your life because of natural developments and personal growth. The emerging truth will feel like the lighter path. A paradigm shift is in the offing, an adjustment that serves you well for years to come. For the Air signs, Gemini, Libra, and Aquarius: 2016 is a year of inner gains: your greater emotional and psychological strength allows you to move on. Now you more easily accept things and view the truth as helping you. Nothing is more important than this new awareness as its reward is greater peace of mind. For the Earth signs, Taurus, Virgo, and Capricorn: Basically, 2016 is a year of increase, with positive events occurring on both inner and outer levels. It feels to you like going further and higher than you've ever gone before. You gain a new sense of stability for many reasons; ultimately lightening your nature so a much more flexible, sensitive, porous you gets ready for new instructions...arriving in 2019. Now begins the journey...you might be wondering what you're planning for. All you can know is what feels right. You're planning for a future that at this point is a series of desires, longings, and beckonings. Follow your heart and on every plane, you'll like the results. Elissa Heyman has a private psychic counseling and healing practice in Santa Fe, NM, and by telephone internationally. Her daily psychic horoscopes are on SantaFe.com, and broadcast on KTAO in Taos. Elissa's website offers free guided meditations recommended by Spirituality/Health magazine, plus an award-winning newsletter. She also facilitates spiritual healing and intuition circles. Phone; 1-505-982-3294, email; elissa@elissaheyman.co. Elissa's website offers a free monthly newsletter, guided meditations, essays on metaphysical subjects, and personal guidance. www.ElissaHeyman.com. You can sign up for Elissa's Monthly Psychic Newsletter here.